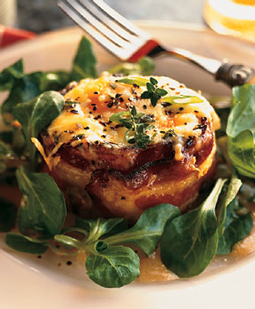 Bacon-Wrapped Eggs with Polenta - A recipe from Savor California, the online showcase for extraordinary gourmet foods and beverages from California. To make polenta: Melt butter in heavy medium saucepan over medium heat. Add green onions and stir until wilted, about 1 minute. Add 3 cups water and salt; bring to boil. Gradually whisk in polenta. Bring to boil. Reduce heat to low and simmer until thick and creamy, stirring occasionally, about 13 minutes. Stir in cheese and thyme. Season with salt and pepper. Heat large skillet over medium heat. Add bacon; fry until beginning to brown but still pliable, about 4 minutes. Transfer bacon to paper towels to drain. Cool slightly. Line sides of eight 1-1/4-cup custard cups with 2 slices bacon each, forming collar. Place 1/2 slice bacon on bottom of each cup. Divide polenta among cups, about generous 1/3 cup each. Press polenta over bottom and up sides of bacon. Crack 1 egg into center of each cup. Sprinkle eggs with remaining cheese, green onions, thyme, and black pepper. Transfer cups to rimmed baking sheet. Run small sharp knife around edge of cups. Tilt cups and slide bacon, polenta, and egg onto plates and serve. Tip: You can make the polenta a couple of days ahead, then assemble an hour or so before serving.